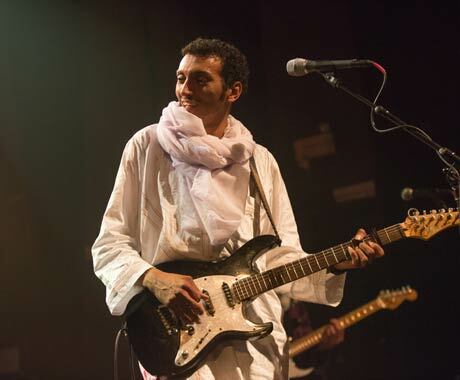 Omara "Bombino" Moctar has travelled far from his home in northern Niger over the past five years; this isn't even his first swing through the North American festival circuit. First noted on Sublime Frequencies' Guitar Music Of Agadez Vol 2 LP a few years ago, Bombino is now on one of the most powerful taste-making record labels around: Nonesuch. Really, what you hear is what you get with him and his ensemble: hard rocking desert blues, taking Tinariwen's electric reinventions of Tuareg music into harder rock terrain. Working with a quartet, he initially started with a couple of acoustic songs. Even in that configuration, he still played stinging lines on the hollow-bodied guitar as the deep bass pulse of calabash percussion shook the room. When the group switched to a straight up rock format of two electric guitars, bass and drum kit, he truly became a guitar hero, playing commanding lead guitar that sounded like Mark Knopfler and Stevie Ray Vaughn playing slightly wonky blues. This music was all power chords, the most basic rock and roll. Whatever the provenance of the music, it all added up to a glorious dance session for the audience. Truth be told, this would have been an above average bar band were it not for the heavy hi-hat of the drummer adding an almost disco or mid-'70s reggae edge to the rockin' tunes to let the dance-challenged know how to move. An extra bonus point goes to the bassist for his elastic green strings.